My nightstand just got a whole lot prettier, thanks to this adorable vanity tray from Life’s a Journal. I really appreciate the crafting skills (of others!) and when this grey ombre striped tray appeared in her Etsy shop, I couldn’t resist. I’m pretty meticulous about keeping the top of my nightstand organized, with just my phone, coaster (can’t go to bed without water! ), alarm clock, glasses and lip balm on display. I’m not ready for bed until I’ve slathered hand cream on and a thick layer of balm. But the thing about that is it gets OOC fast. At one point, there was nearly a dozen tubes and pots piled up in a corner. Clutter on the nightstand leads to stress-y dreams. I’m sure there’s a connection somewhere, right? With this cute vanity tray, I feel an open invite to display my lip wares. As many as it will fit, which as it turns out is plenty. There’s totally room for more, but I’m doing this whole spring cleaning thing, ya know. Editing my life and all that jazz. What is on display is special to me. 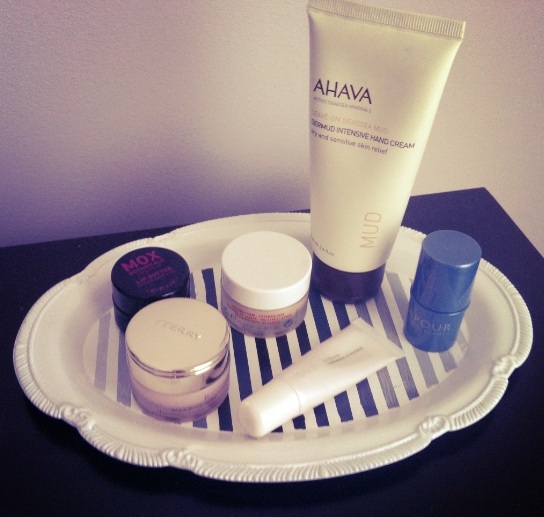 I’ve gone through many tubes of the AHAVA Dermud and love how soft it is on my hands. The smell is soothing to me and it’s so engrained in my nightly routine that I pretty much exclusively associate the aroma with sleepytime now! One of my most treasured splurges is the By Terry Baume de Rose. I use it sparingly because it was definitely an indulgent treat. I bought the NUXE Reve de Miel on a trip to Paris with my husband, and the texture of that is wildly different than any other balm, in a good and interesting way. The little tub of MOX Botanicals Lip Butter is so weighty and fancy — a Birchbox discovery I made (the Pomegranate + Fig scent is exclusive to their shop!) The two I usually take off of my nightstand and in my purse are the Jouer Lip Enhancer and Vapour Organic Lux Lip Conditioner — they are both daily staples for me. What’s on your nightstand? A fellow hoarder of moisturizer? I love that you love balms as much as I do! That tray is so pretty and it makes your nightstand balm collection look like art! I think my fave hand cream for night is L’Occitane Shea Butter hand cream b/c it’s so…divinely balmy! As far as nightly lip balms, I too have about 5 on my night stand, but I think the Blistex Moisture Melt is my new #1. PPS: PARIS!! It’s my life-long dream to visit Paris! Was it amazing? The tray is very lovely! I have a great lve for vanity traysMy mother actually passed her great love for the Ahava Hand Cream on to me, the scent remind me very much of her. She has used is for years as the only effective treatment for the exzema on her hands, which she passed on to me as well.. It does seem to get rid if it 🙂 I love all those lip balms also! 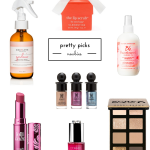 I need a nightstand overhaul…way too many products hanging out! Love this cute tray! !